That means I need a passport... and a safe word? I'm just surprised so many people think that Afrika is a new concept, seeing as these sorts of games have been around for about 5 years. 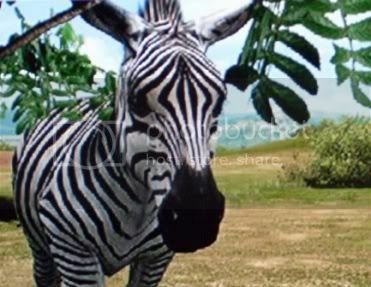 Sounds like Far Cry 2, except that in FC2, I just ran zebras down with my jeep, rather than photographing them. It's about time someone revived the Pokemon Snap genre. Only they used real animals this time and no friggin rails. The rest of your days, perhaps? We're in a recession, so it will only be until next Tuesday. Pumbaa is too big to fail! I agree. Look at what happened when Mufasa failed: competitors circled his corpse like hyenas, and now we're all stuck with the scars. Some sort of intervention was needed to keep the wildebeest from plummeting then, and something is needed now. If we don't learn from our mistakes, we're bound to repeat them. Edit: On topic, this looks like a really interesting game. Out of curiosity, what happens if a predator does come after you? It seems like a game that would be spoiled a bit by a die-and-reload mechanic. Of course climbing out of a Jeep in Africa and hiding behind a bush for a nifty zebra shot will probably have you end up dead and mangled due to other predators. But hopefully you got the shot first and the camera can auto-upload the images? No, but Frank Bilders might find it. So Play-Asia finally got more copies in stock and shipped mine out today. I'm definitely looking forward to getting my hands on it and checking it out. Be sure to let us know how you like it! I will be sure to report back after returning from safari. Would this be a game that I could play with my nephew? He's five. I'm just wondering how easy it would be to control and whether it would be frustrating for him. I'll write back with my impressions after it arrives and I check it out. The game resets you back to the jeep, so your only punishment is losing whatever effort it took to sneak up to the animals to begin with. It's actually quite easy to control, you only use one button and the thumbsticks most of the time. You even use the sixaxis control when you want to turn the camera on it's side. The only issue is the same issues most gamers might have, which is he might find it boring quite quickly. The limit in the amount of time in the day, the number of pictures you can save in your camera and the difficulty of getting close to the animals leads to a very slow and precise play style. Well the thing is, my nephew adores Zoo Tycoon. He's not very good at it and the animals often die, but he loves it, because of the animals. I think he'd really like it. Got it yesterday and fired it up. Be aware there is an install. A boring and slow install. Down on the d-pad will make you crouch low, right/left on the d-pad will shift your weight in the corresponding direction so you can peak out of a bush or get a better shot. The start button will put you into first-person. Quick and dirty: I like it. The animations of the beasts are fluid and fun to watch (I especially like the twitchy ears of the hippos). It's a reasonably slow-paced game and patience is key. I watched the hippos for a long time before I felt like I was able to get a good-enough shot of one of them yawning. And on a couple of shoots I felt like I wasn't able to maximize my points because of my equipment as opposed to my shot (but I suppose that's going to be subjective... I thought I nabbed the quintessential drinking-giraffe pic, but I suppose 9/10s of the point total is fine). After just two days of shoots I was able to pick up some additional storage for my camera, so credits weren't a huge issue, I suppose. Kuddles is right about the language barrier... there isn't one. Everything defaulted to English. All text is written (which is semi-disappointing, I would have even welcomed Chinese voices—it gets quiet on the Savannah) and it's serviceable. But the bulk of your time is spent out in the wild with the animals anyway, quietly observing and waiting for a close, clear shot. I got too close to the hippos a couple of times. When it happened the camera zoomed in on an angry hippo mug before returning to me... the screen flashed red on the sides and I knew it was time to clear out. I didn't bait the hippo into attacking because I was afraid he'd trample my camera, so the game obviously immersed me enough into its world for me to react genuinely. For folks with a Wii but no PS3, it's an experience similar to Endless Ocean, but with ambient sound instead of a synth track. This is the sort of game where you know right off the bat if you might enjoy it. For $54 it was worth the import. I look forward to seeing what's prowling around deeper in the Savannah. So, I bought this game, and I'm having a serious problem. On the tutorial mission, when I press X to get out of the Jeep, I can't move my character. I can kinda shake the camera sometimes with the right stick, but then nothing happens. I've tried nearly every button, but it doesn't work. Any ideas? I'm reinstalling the game, and deleting my save. I'm also unplugging everything from my PS3, although my DS3 is on controller 1. Argh! I haven't played the game, but a quick search in a couple places didn't find anyone having a similar problem. Hope the reinstall works. Filthy skimmer, but can you get mauled by lions or trampled by Wildebeasts while you're playing? It's coming to the U.S. I'm glad to hear this is coming to the US and we should be seeing a nice update at E3 next week. It has some promise and definitely a refreshing concept. Here's a brief write up from IGN. By the way, is there any way to convert this thread over to the Games forum since it'll be missed buried in the homepage? Looks like the game got pushed to October 6th (was coming out tuesday). I have no official proof, but 95% of the "major" sites changed the release date.